Garrett is the lead singer of the Australian rock band Midnight Oil. He served as President of the Australian Conservation Foundation for ten years and, in 2003, was appointed a Member of the Order of Australia for his contribution to the environment and music industry. He is also known for his signature bald head, his unique and eccentric dance style, and a "mesmerising onstage presence". He was the Australian Labor Party member of the House of Representatives for the seat of Kingsford Smith, New South Wales, from October 2004 to August 2013. After the Labor Party won in the November 2007 election, Garrett was appointed Minister for the Environment, Heritage and the Arts by Prime Minister Kevin Rudd. On 8 March 2010, his portfolio title was changed to Environment Protection, Heritage and the Arts. He continued in this role in Julia Gillard's first Ministry. He was re-elected at the 2010 election, and was appointed Minister for School Education, Early Childhood and Youth by Prime Minister Julia Gillard. He was sworn into this portfolio on 14 September 2010 as a member of the Second Gillard Ministry, and following a leadership spill in the Australian Labor Party, Garrett resigned his position as Minister for School Education, Early Childhood and Youth and moved to the backbench. He later announced that he would not be contesting his seat at the next federal election. Born on 16 April 1953, in Wahroonga, Sydney, Garrett attended Gordon West Public School and then Barker College in Hornsby before studying politics at the Australian National University (ANU), where he was a resident at Burgmann College, and later law at the University of New South Wales. His father died while he was still at school. His mother died in a fire at the family home, during his period at university. About the same time he became a singer with the Australian rock band Midnight Oil in 1973, after responding to an advertisement placed by one of the band's founding members, Rob Hirst. In tandem with their musical and commercial success, the band were long identified with environmental causes. They were particularly critical of United States' military and foreign policies during the 1980s. Garrett was president of the Australian Conservation Foundation (1989–93, 1998–2004). He joined the international board of Greenpeace in 1993 for a two-year term. He served as adviser and patron to various cultural and community organisations, including Jubilee Debt Relief, and was a founding member of the Surfrider Foundation. On and off stage, Midnight Oil often made political statements. At the closing ceremony of the 2000 Olympic Games in Sydney, the group performed before the Prime Minister, John Howard, and a television audience of hundreds of millions, wearing black overalls bearing the word "sorry". This referred to the Howard Government's refusal to apologise to Aboriginal Australians for the former policy of removing of Aboriginal children from their families. In 2000, Garrett was awarded the Australian Humanitarian Foundation Award in the environment category and in 2001 he received an honorary Doctorate of Letters from the University of New South Wales. He left Midnight Oil in 2002 to concentrate on his environmental and social activism, effectively spelling the end for the group. Following the Asian tsunami of Boxing Day 2004, Garrett and the other members of Midnight Oil performed for two gigs as part of the fund-raising event WaveAid. On 7 July 2007, Garrett presented Crowded House at the Australian leg of Live Earth. On 14 March 2009, Garrett performed live at the Melbourne Cricket Ground, as part of Midnight Oil, for Sound Relief, to raise money for the Victorian bushfire appeal. In November 2012, Garrett and Paul Kelly inducted Yothu Yindi in the ARIA Hall of Fame and performed with the band their best-known song "Treaty". On 5 May 2016, Peter Garrett announced that Midnight Oil would be reforming and stated that they would be touring in 2017, including a trip to the United States. Midnight Oil stated on their Facebook page: "We wanted you to be the first to know that the five of us are planning to do some gigs in Australia and overseas during 2017." On 15 May 2016, Peter Garrett announced a solo album, A Version of Now, which was released on 15 July 2016. Following the announcement of the album was news of Garrett's Australian tour, starting on 21 July 2016 and running until 17 August 2016. Garrett's website stated that "Most of the songs on 'A Version of Now' were composed recently as Peter penned his autobiography" and "Throughout this tour, the iconic frontman will be backed by an all-star band that he's christened 'The Alter Egos'" that includes well-known Australian musicians "Martin Rotsey from the Oils on guitar, Mark Wilson from Jet on bass and Peter Luscombe (Rockwiz, Paul Kelly, Black Sorrows) on drums". Garrett's first attempt at entering politics was in December 1984, when the Nuclear Disarmament Party invited him to stand for a New South Wales seat in the Australian Senate at the federal election. He refused at first, but after consulting the band, he agreed on condition that he head the ticket. He needed 12.5% of the vote to win a seat in the Senate voting system, but a primary vote of 9.6% was insufficient when Labor gave its preferences to the conservative Liberal and National Parties ahead of the NDP. In June 2004, Labor leader Mark Latham announced that Garrett would become an Australian Labor Party candidate for the House of Representatives at the 2004 federal election, in the safe New South Wales seat of Kingsford Smith which was being vacated by the former Cabinet minister Laurie Brereton. There was some initial criticism from Labor members in the electorate, as this overrode the local branch's wishes. He won an easy victory on 9 October, increasing the Labor majority there. In June 2005, Garrett was appointed Shadow Parliamentary Secretary for Reconciliation and the Arts. During his political career, it was reported that Garrett had modified many of his earlier views. He supported the U.S.-Australia alliance, and no longer opposes the Joint U.S.-Australian Defence Facility at Pine Gap. At the time, he stated that he would argue for environmental causes inside the Labor Party, but would observe the decisions of the ALP caucus, including accepting any decision to change Labor's "no new uranium mines" policy. Garrett's change of stance drew criticism from both journalists and Midnight Oil fans, who contrasted Garrett's former pronouncements on environmental and political issues he made before joining Labor. A polling booth, 2007 election. While the media sometimes labelled him a "turncoat", some commentators, such as the left-wing Eureka Street and the Canberra Times columnist and political science ANU academic, John Warhurst, who defended his need to be a "team player" if he was going to play the political game "from the inside". Garrett campaigned for Labor in the 2006 Victorian state election. There was controversy when he sent a letter to the constituents of the seat of Melbourne, where Labor and the Greens were embroiled in a tight contest. In the letter Garrett urged voters not to vote for the Greens, claiming they were in alliance with the conservative Liberal party. This incurred the ire of Greens leader and former Garrett ally, Bob Brown who accused Garrett of having "sold out" and of going against the green movement, since joining the Labor Party. In December 2006 Kevin Rudd, the newly elected Labor Party leader, appointed Garrett to his Shadow Cabinet as Shadow Minister for Climate Change, Environment & Heritage, Arts. Garrett had voted for Rudd in the December 2006 leadership spill, a decision he would later regret saying it was "certainly the biggest" mistake he made in his political career. In the 2007 Federal election, Garrett was re-elected to his seat with a 4.56% swing towards him. However, his campaign was fraught with a number of tactical errors, including journalist Steve Price claiming that Garrett had said to him that Labor would simply change all their policies once they got into power. This was disputed by Garrett as a "short jocular conversation". Garrett was appointed as Minister for the Environment, Heritage and the Arts in the First Rudd Ministry; however, his responsibilities did not include the climate change role, which was given to Penny Wong. On 20 December 2007, Garrett approved a controversial plan to dredge Melbourne's Port Phillip Bay. This move attracted strong criticism from environmental groups who were concerned that the 23 million cubic metres of sand, rock and contaminated silt dredged from the bay's shipping channels will affect fishing and tourism in the area. In 2007, he refused as incoming arts minister the federal funding that would have enabled a remount of Elke Neidhardt's acclaimed Adelaide production of Der Ring des Nibelungen in 2008. As Environment Minister, Garrett was responsible for implementing the Labor government's whaling conservation policy, which included the cessation of commercial and "scientific" whaling. Japan's annual trip to the Southern Ocean to kill whales in the name of science was the emotional front line for the protagonists. The Australian government tried to negotiate a cessation of "scientific" whaling at the annual meetings of the International Whaling Commission. These negotiations were unsuccessful, and in 2013 Australia took Japan to the International Court of Justice (ICJ). In March 2014, the ICJ announced its judgement that Japan must stop whaling in the Southern Ocean, which had actually been for commercial rather than scientific purposes. Garrett approved a major expansion of South Australia's Beverley uranium mine in August 2008, saying the uranium mine would use world's best practice for environmental protection. Garrett's decision was praised by the uranium industry, but criticised by the Australian Conservation Foundation which said the decision would result in the mine spreading acid and radioactive pollution over 100 square kilometres (39 sq mi). Garrett announced in October 2008 that the government would be withdrawing all A$2.6 million funding from Australian National Academy of Music (ANAM). In 2009, Garrett would not give the proposed A$2 billion Tamar Valley mill approval until more studies were undertaken on its potential impact on marine environments. A new condition was put on the mill meaning Gunns could be liable for criminal and civil penalties if the mill is approved and breaks defined "environmental limits". In December 2009 Garrett rejected the proposal to impound the Mary River through the construction of the Traveston Crossing Dam. Garrett determined that the impacts of the proposed dam on the threatened species of Australian lungfish, the Mary River Turtle and the Mary River cod would be too great and unacceptable and of national environmental significance. The majority of caucus felt he had been badly treated. For Rudd and his office to position Garrett as the fall guy was disgraceful, weak, sneaky, unprincipled and just plain wrong. All along, Peter properly put his objections to the administration of the program on the record. How can you have a situation where Rudd executes complete and total influence, micromanages everything, yet not the home insulation program? The shape and execution of the program was certainly designed by the prime minister's office, if not the prime minister himself. Garrett retained the portfolio of Environment Protection, Heritage and the Arts in the First Gillard Ministry. Garrett was re-elected at the 2010 federal election with a substantially reduced majority, surviving a two party preferred negative swing of 8.1%. After the election he was appointed Minister for School Education, Early Childhood and Youth in the Second Gillard Ministry. On 2 February 2012, Garrett, with Jenny Macklin, the Federal Indigenous Affairs Minister, announced an expansion of the Improving School Enrollment and Attendance through Welfare Reform Measure (SEAM), a controversial program under which parents of indigenous students in the Northern Territory can have their Centrelink payments suspended for three months if their children are not attending or enrolled in school. Though the Government claimed that the program improved indigenous school attendance, it was heavily criticised by indigenous spokespeople and academics for being excessively punitive rather than implementing other policies that have been far more effective in improving school attendance, such as reinstating bilingual learning. Furthermore, the Government was criticised for being deceptive about getting a mandate for this from consultation with indigenous leaders. On 7 September 2011, as Education Minister, Garrett announced an alteration of the National School Chaplaincy Program by offering schools the opportunity to employ, instead of "a religious support worker" (chaplain), a "secular student well-being officer". In June 2012, the High Court held that the Commonwealth's funding agreement for the program is invalid. In June 2013 Garrett vowed to increase funding to public schools as recommended in the Gonski Report to reduce inequality in educational performance. In a 2014 book review, Garrett stated that he was concerned at growth of private schools, which could lead to "an increasingly segregated school system". He noted that the National School Chaplaincy Program needed to change their guidelines because "the line between chaplains acting to support students in the provision of general pastoral care and proselytising was too easily crossed". Garrett supported Gillard in the June 2013 leadership spill of the Labor Party, where Rudd defeated Gillard. Garrett immediately announced that he resigned his ministerial commission, and a few days later, announced that he would not seek re-election at the 2013 federal election. Garrett is married and has three daughters. Garrett is the uncle of former Nickelodeon Australia and former SourceFed personality Maude Garrett. Garrett's grandfather, Tom Vernon Garrett, was one of many prisoners of war who died in the sinking of the SS Montevideo Maru. That sinking is considered the worst maritime disaster in Australia's history. He refers to this event in the opening line of the Earth and Sun and Moon track "In the Valley". ^ a b "Garrett, Peter Robert: Member of the Order of Australia". It's an Honour. Commonwealth of Australia. 9 June 2003. Retrieved 25 June 2010. ^ Stafford, Andrew (17 July 2016). "Midnight Oil frontman Peter Garrett is back – and he's ready to dance again". The Guardian. Retrieved 9 June 2018. ^ "Midnight Oil drummer hints at reunion after Peter Garrett finishes memoir". The Sydney Morning Herald. 3 June 2014. Retrieved 9 June 2018. ^ "The Top 5 Peter Garrett Dance Moves". Triple M. 27 February 2017. Retrieved 9 June 2018. ^ McGregor, Richard (22 March 1979). "Australian Reviews". Rolling Stone Australia. North Sydney, NSW: Silvertongues Pty Ltd. p. 43. ^ "Australia's Rudd unveils cabinet". BBC News. 29 November 2007. Retrieved 22 May 2010. ^ "Peter Garrett retains Kingsford Smith". Southern Courier. 21 August 2010. Archived from the original on 27 August 2010. Retrieved 15 April 2011. ^ White, Cassie (11 September 2010). "Gillard unveils major frontbench shake-up". ABC News. Australia. Retrieved 15 April 2011. ^ a b "Garrett quits as Rudd returns". Nine News. AAP. 26 June 2013. Archived from the original on 29 June 2013. Retrieved 26 June 2013. ^ a b Griffiths, Emma (26 June 2013). "Kevin Rudd defeats Julia Gillard 57–45 in Labor leadership ballot, paving way for a return to PM". ABC News. Retrieved 26 June 2013. ^ "Peter Garrett in Paris awarded d'Officier dans l'Ordre des Arts et des Lettres". La Perouse. 14 July 2009. Retrieved 9 June 2018. ^ "In recognition of The Hon. Peter Garrett AM MP" (PDF). WWF. 11 April 2010. Retrieved 9 June 2018. ^ "House of Representatives – Members". Parliament of Australia. 16 April 1953. Archived from the original on 22 February 2011. Retrieved 15 April 2011. ^ a b Peatling, Stephanie (12 June 2004). "The personal price of a political choice". The Sydney Morning Herald. Retrieved 30 May 2016. ^ "Awards". ANU (Press release). 3 June 2009. Archived from the original on 14 September 2009. Retrieved 5 March 2010. ^ "Yes, I was a teenage stoner, says candid Minchin". The Age. 12 July 2007. Retrieved 17 November 2012. ^ "About UNSW & Sydney". UNSW. Archived from the original on 14 September 2009. Retrieved 5 March 2010. ^ "Peter Garrett". MySpace. Archived from the original on 17 April 2010. Retrieved 25 June 2010. ^ Kingston, Margo (14 June 2004). "Howard's memory of burning beds". The Sydney Morning Herald. Retrieved 30 May 2016. ^ Nicholson, Anne Maria (3 June 2014). "Midnight Oil exhibition chronicles musical history, introduces new song, The Ghost of the Roadhouse". ABC News. Retrieved 30 May 2016. ^ "Q&A Panellist Peter Garrett". ABC News. Retrieved 30 May 2016. ^ "Peter Garrett back as Oils reunite". The Australian. News Corp. 5 May 2016. Retrieved 30 May 2016. ^ "Garrett rocks out with Oils at Sound Relief". ABC News. Australia. AAP. 15 March 2009. Retrieved 25 June 2010. ^ "Winners For The 2012 Aria Awards Announced!" (PDF). ARIA Music Awards. 29 November 2012. Retrieved 9 June 2018. ^ McCabe, Kathy (5 May 2016). "Midnight Oil to reunite for a series of concerts in 2017 after lead singer Peter Garrett releases solo album". News.com.au. Retrieved 30 May 2016. ^ Condon, Dan (4 May 2016). "Midnight Oil are reforming". Double J. Retrieved 9 June 2018. ^ "Midnight Oil". Facebook. Retrieved 9 June 2018. ^ "New album 'A Version of Now' out Friday 15 July". Peter Garrett. 15 May 2016. Retrieved 30 May 2016. ^ "Peter Garrett announces Australian Tour + 'A Version of Now' pre-order available now". Peter Garrett. 30 May 2016. Retrieved 30 May 2016. ^ "Peter Garrett: solo album A Version of Now leads Midnight Oil comeback". The Australian. News Corp. 28 May 2016. Retrieved 30 May 2016. ^ Fisher, Gillian (1995). Half-Life: NDP: peace, protest and party politics. Sydney: State Library of New South Wales Press. ISBN 978-0-73058-958-7. ^ Davies, Anne; Contractor, Aban; Peatling, Stephanie (8 June 2004). "ALP clears runway for Garrett's next gig". The Sydney Morning Herald. Retrieved 5 July 2013. ^ Grattan, Michelle (30 October 2005). "Sedition bill 'a threat to arts'". The Age. Melbourne. Retrieved 5 July 2013. ^ a b Warhurst, John (17 October 2007). "Politics is a team sport". Eureka Street. Retrieved 25 June 2010. ^ Grimm, Nick (10 June 2004). "Peter Garrett back flips on Pine Gap" (transcript). PM. Australia: ABC Radio National. Retrieved 25 June 2010. ^ Heywood, Lachlan (12 December 2006). "Power Beats Passion". The Courier-Mail. Archived from the original on 27 November 2007. Retrieved 9 June 2018. ^ "Garrett denies selling out beliefs". The Daily Telegraph. Australia. 1 April 2007. Archived from the original on 27 November 2007. Retrieved 15 April 2007. ^ "Brown sees red over Garrett 'sell out'". The Sydney Morning Herald. 29 November 2006. Retrieved 25 June 2010. ^ "Shadow Ministry 10 December 2006" (PDF). Labor eHerald. ALP. 10 December 2006. Archived from the original (PDF) on 28 November 2007. Retrieved 15 December 2007. ^ Mitchell, Georgina (11 October 2015). "Peter Garrett uses TV interview to say Kevin Rudd was a danger to Australia". The Sydney Morning Herald. Retrieved 9 June 2018. ^ "Garrett pathetic over pulp mill: Howard". The Sydney Morning Herald. 9 October 2007. Retrieved 5 November 2007. ^ "Tamar Valley pulp mill lacks interested investors, campaigner says". ABC News. 10 February 2014. Retrieved 9 June 2018. ^ "Australian Electoral Commission summary of Kingsford Smith, Federal Election 2007". Australian Electoral Commission. 19 December 2007. Retrieved 19 December 2007. ^ a b Topsfield, Jewel (30 November 2007). "Garrett stripped of climate change role". The Age. Retrieved 9 June 2018. ^ "Kevin Rudd's Cabinet in full". News.com.au. 29 November 2007. Archived from the original on 1 December 2007. Retrieved 9 June 2018. ^ "Garrett approves Port Phillip dredging". The Age. 20 December 2007. Archived from the original on 10 February 2008. Retrieved 25 June 2010. ^ "Counter-terrorism police seek meeting with bay activists – Climate Watch". The Age. Melbourne. 16 January 2008. Retrieved 25 June 2010. ^ "Stoush brewing over Port Phillip dredging plan". ABC News. Australia. 9 January 2008. Retrieved 25 June 2010. ^ Muir, Fabian (7 December 2013). "Elke Neidhardt: A passionate life lived in the arts". The Sydney Morning Herald. Sydney. Retrieved 11 December 2013. ^ Cosic, Miriam (29 November 2013). "A trajectory from actress to visionary of the opera stage". The Australian. Retrieved 11 December 2013. ^ Bassett, Peter (10 November 2014). "Adelaide's Ring, ten years on". Limelight. Sydney. Retrieved 10 November 2014. ^ "The future of international whale conservation". Minister for Environment, Heritage and Arts. Australia. 18 February 2009. Retrieved 7 July 2014. ^ "Whaling in the Antarctic: Australia v. Japan" (PDF). International Court of Justice. Netherlands. 31 March 2014. Archived from the original (PDF) on 31 March 2014. Retrieved 7 July 2014. ^ Franklin, Matthew (29 August 2008). "Uranium mine gets nod from Peter Garrett". The Australian. Retrieved 29 August 2008. ^ Alexander, Cathy (28 August 2008). "Garrett changes tune on uranium". News.com.au. Archived from the original on 1 September 2008. Retrieved 29 August 2008. ^ Usher, Robin (24 October 2008). "Canberra axes music academy funds". The Age. Melbourne. Retrieved 25 June 2010. ^ Maiden, Siobhan (5 January 2009). "Pulp mill decision announced". ABC News. Australia. Retrieved 15 April 2011. ^ "Garrett rejects Traveston Dam". ABC News. Australia. 11 November 2009. Retrieved 9 June 2018. ^ "Garrett pays price for insulation debacle". ABC News. Australia. 26 February 2010. Retrieved 25 June 2010. ^ "Garrett 'disappointed' by demotion". ABC News. Australia. 2 March 2010. Retrieved 25 June 2010. ^ "Insulation firms eligible for $500k payout". ABC News. Australia. 6 May 2010. Retrieved 9 June 2018. ^ "Rudd admits insulation scheme mistakes". ABC News. Australia. 27 May 2010. Retrieved 9 June 2018. ^ Cassidy, Barrie (18 October 2010). "The killing of Tyrannosaurus Rudd" (transcript). The Drum. ABCTV. Retrieved 15 April 2011. ^ "Kingsford-Smith: First Preferences and Two Candidate Preferred". Election 2010. Australian Electoral Commission. 2010. Retrieved 5 July 2013. ^ "The Gillard ministry". The Sydney Morning Herald. 11 September 2010. Retrieved 12 September 2010. ^ Gillard, Julia (11 September 2010). "Prime Minister announces new Ministry" (Press release). ALP. Archived from the original on 14 September 2010. Retrieved 12 September 2010. ^ "Schools given greater choice under expanded chaplains program". Department of Education, Employment and Workplace Relations (Press release). Government of Australia. 7 September 2011. Archived from the original on 19 October 2011. Retrieved 9 September 2011. ^ "National School Chaplaincy Program". Department of Education, Employment and Workplace Relations. Government of Australia. Archived from the original on 8 June 2009. ^ Tucker, Breanna (8 September 2011). "Chaplaincy change a crisis of faith". Canberra Times. Retrieved 9 June 2018. ^ "High Court upholds chaplaincy challenge". ABC News. Australia. 20 June 2012. Retrieved 20 June 2012. ^ Garrett, Peter (28 November 2012). "High quality education for every Australian child". petergarrett.com.au. Archived from the original on 2 March 2014. Retrieved 9 June 2018. ^ Garrett, Peter (30 May 2014). "Free, compulsory and secular: 'Taking God to School' by Marion Maddox". Sydney Review of Books. Retrieved 9 June 2018. ^ Chilcott, Tanya (30 May 2014). "Former education minister Peter Garrett says state schools 'not capable of delivering comparatively thorough education'". News.com.au. Retrieved 9 June 2018. ^ Farr, Malcolm (26 June 2013). "Which ministers will survive the Rudd ascendancy?". The Australian. Retrieved 5 July 2013. ^ Cleary, John (9 June 1999). "The Religion Report – 9/06/99". ABC News. Australian Broadcasting Corporation. Archived from the original on 6 October 2010. Retrieved 6 October 2010. ^ "Michael Mucci: The power and the passion". Prizes: Archibald Prize 2007. Art Gallery of New South Wales. 2007. Retrieved 5 July 2013. 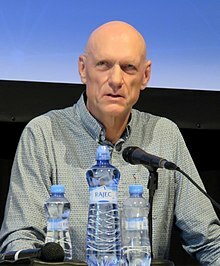 Wikimedia Commons has media related to Peter Garrett.